The sun is high up in the sky and a column of dilapidated trucks trundling past kick up an opaque cloud of dust, enveloping everything in a fine layer of golden brown grime. I discover the muddy imprint of a dust-sweat admixture when I wipe my forehead with a handkerchief. The mercury has easily crossed 40 degrees Celsius here at the Transport Nagar along the NH44 in Jammu — a vast unpaved transitory home for trucks — much to everybody’s discomfort, and the ferocious sun beating down mercilessly is making my head throb. This must be the forewarnings of a sunstroke, I think, and plod to the nearest watermelon stand. As I feel the sweet, lightly spiced juice splash down my throat, I recall the purpose of my visit: to hitch a ride from this sweltering truck depot to salubrious Srinagar in the Kashmir Valley, a distance of just 300 km along NH44, but a world apart climatically. I had been hoping to hitch a ride immediately upon my arrival in the depot at around noon, but had spent the last couple of hours chatting with truck drivers. They told me that trucks plying on NH44 follow a convoy system and leave for Srinagar after dark. It is a constraint of the narrow, mountainous two-lane roads that compels truck traffic to be directed towards Srinagar and Jammu respectively on alternate days, to avoid undue traffic snarls. After midnight, the convoy is flagged off from Udhampur, around 80 km from Jammu towards Srinagar. I am resigned to spend a few hours in idle waiting when I receive an unexpected call from Farooque, one of the truck drivers whom I had given my number and requested to inform me when he’s leaving. “Haan, dus minute mein nikal rahe hain,” he says at around 3 pm and asks me to meet him near an SBI ATM in the terminal. My joy knows no bounds and at that point, even a blast of hot highway breeze is preferable to drowning in my own sweat. I just want to get moving away from this stubborn heat and head towards the misty mountaintops. Farooque, a lithe 35-year-old with a nervous crinkly smile and twinkling eyes dressed in drab grey trousers and a checked T-shirt, always prays before starting his journey. The route is full of treacherous winding roads and he needs all the supernatural assistance he can get. His truck is a sturdy red and green six-wheeler with stylish sliding doors, the first that I have seen on a truck. It has 786 (a number used as a protective talisman among South Asian Muslims), Ya Allahand Ya Mohammad painted in bright colours on the front and back. The designs on the cabin interior and truck exterior are minimalistic with just abstract geometric shapes etched on sun-mica, in adherence to the tenet of Islam that prohibits the depiction of any living creature. The goods Farooque is transporting is a whole lot of urea, 20 tonnes of it, more than double his truck’s capacity of nine tonnes. They are to be used on apple trees that grow in the higher reaches of the Kashmir Valley, primarily in the districts of Baramulla, Anantnag, Kupwara, Kulgam, Shopian and Pulwama. The sliding doors close with an exclamatory sound and just like that we’re off, out of the dusty terminal and onto the narrow lanes of Jammu. I notice there’s no left-hand mirror on the truck and point it out to Farooque. He jumps out at a petrol pump and fits a mirror into the socket in a jiffy. He’s clearly quite experienced and upon inquiry, he tells me that he’s been driving since the past 15 years, five of them on probably the toughest road in India to drive on: the Srinagar-Leh highway. I instantly feel safer. If he’s still alive, he must be good. This is confirmed later, when I am mildly alarmed to see him drive with his elbow, drinking water with his left hand and talking on the phone with his right. Not recommended at home! Soon, we’re on NH44, a well-paved four-lane highway with even a divider to boot. I ask Farooque if the road is consistently good up to Srinagar. He laughs and says: “The road’s like this till Udhampur, for around 60-70 km. After that, the road gets bad and also quite dangerous. Even this road hasn’t been constructed by the sarkar. Private contractors have constructed roads from Jammu to Udhampur by cutting tunnels.” It turns out he’s partly right and the road has indeed been constructed on a PPP model. But I am also able to sense how incompetent and apathetic the government is thought to be here. The sun is blazing through the truck window, the hot breeze isn’t helping as much as I thought it would and I find myself daydreaming about the sylvan Kashmir of picture postcards. The Tawi river is our constant companion for quite some time, gleaming and twisting amid a boulder-strewn landscape of stark beauty, while monkeys chatter on the bare branches of trees. These monkeys are remarkably acclimatised to the highway life. They even look either ways before crossing the road! We pass diminutive temple-shrines of Sufi pir babas, reputed to grant every mannat a devotee asks for and a sombre reminder of Kashmir’s historical association with composite Sufi culture. We must have travelled around 30 km from Jammu, trudging on inclines at 20 kmph and advancing on level ground at not more than 45 kmph, thanks to overloading, when I notice a group of lanky young men standing by the side of the road, thumbs up in the air, cloth bags lying by their side, hustling for a ride. Farooque seems reluctant at first but eventually brings his truck down to a crawl and shouts out from the window. “2,500 rupaye lagenge,” he demands brusquely. I’m puzzled. I discover the said amount is for ferrying four sawaaris, cloth bags containing all their belongings as well as a bundle of wood, right up to Sopore, a distance of around 300 km. While they negotiate the price, I find myself getting nervous about how the seven of us are going to fit inside the cramped truck cabin. Eventually, Farooque decides they’re not worth the trouble and I heave a sigh of relief. But as we go on, it becomes an increasingly frequent sight to see people hunkering on both sides of the road and I begin to sense a pattern at work here. An Afghan-looking man donning a polka-dotted turban seated on his haunches along with a kid, his belongings scattered around, stares at us dolefully as we whoosh by. “Mahine bhar ka season hota hai garmiyon mein. Yeh sab Gujjar pahaadi ilaake ki taraf jaa rahe hain apni bhed bakri charane,” Farooque informs me. I ruefully think about how Farooque is foregoing a decent sum of money, around ₹1,500, to be earned by ferrying them, on account of us occupying space in the cabin. I consider offering him some cash as compensation. Farooque declines it when I do later. “Aap hamare mehman hain,” he says firmly. I ponder on how the same hospitable treatment isn’t meted out to the Gujjars: markers of ingrained feelings of suspicion and hostility that settled folk harbour towards nomads. These Gujjars and Bakarwals, comprise 30% of Jammu & Kashmir’s population. While some of them have settled down, many of them, especially the Bakarwals, still follow the age-old rite of biannual transhumance: the seasonal movement of entire flocks and families to lush sub-alpine and alpine pastures, often above the tree line, a practice known as behak. Usually, several households move together in a group called kafila.Previously, the Gujjars used to carry their belongings on horseback, a mode of transportation that has been replaced by trucks now. By September, they move back to the plains to avoid freezing winters in the Vale. They are accompanied by fierce dogs that guard the flock from wild animals in the meadows. Their traditional migratory route is almost parallel to the Jammu-Srinagar national highway, and the sight of flocks of bleating sheep and goats reluctantly walking on the highway, herded by two to three young boys armed with sturdy lathis, is extremely common. These herders typically choose to walk on the highways after dusk to avoid the searing heat; many of them take a shorter route using well-worn mountain trails. After declining several prospective Gujjars and Bakarwals, Farooque finally slows down beside a man along with his aged mother, partly out of pity. The man, Salim, has beady eyes and is wearing a white kameez flecked with specks of dirt along with a shocking pink ring on his finger. Farooque demands ₹1,500. The man counters with an offer of ₹1,000. They haggle for a while and arrive at a price of ₹1,300. We help his elderly mother through the high door of the truck. The man throws his belongings on top of the truck and jumps in. He takes off his shoes — yes, most nomads wear shoes to help traverse tricky mountainous terrain –— and our nostrils are immediately assaulted by a vile stench. “Throw those socks out,” Farooque instructs the man. He obliges, but the smell persists. It is then I notice that his feet look diseased, like they’ve been immersed in hot water for eternity: wrinkled, swollen, bulbous feet with flies hovering near them. His mother looks mortally ill, constantly coughing and wheezing, and Salim tells me that he’s taking her to a hospital near Srinagar. “Bhed bakri ka kaam karte hain. Hawa badal gayi hai, isiliye upar jaa rahe hain,” he says. He has a flock of around 200 goats and sheep which his brother is herding via mountain trails. He says his brother makes a living by selling wool and dairy products, also using forest produce to supplement their milk-heavy diet. “Pahadon mein jhuggi baand ke rehte hain,” he says. He converses with Farooque in Dogri, a dialect similar to Punjabi spoken in Jammu and surrounding districts, but also speaks Kashmiri and Urdu, along with his native Gojri language. Farooque himself is a Dogra Muslim from Rajouri district. We stop around 45 km from Jammu when Farooque sees a few truckers, part of Farooque’s informal retinue. They have picked up a large party of Gujjars: a solitary goat and his kid, two elderly women, a couple and their little daughter, along with the husband’s cousin in his early 20s. They have cloth sacks bound by coir rope that contain utensils and enough apparatus to set up a tent. The Gujjars bring a goat and a kid — to keep the goat lactating — along with them to meet their dairy needs on the way to the pastures. It’s getting dark by now and I can see the lights of Vaishnodevi from where we are, shimmering on an otherwise bare mountain. The other truckers, Liaqat and Javed, who are also brothers, are cleaning their trucks quite meticulously, splashing water on every visible part of the machine and scrubbing it with a cloth. Liaqat, a dark brooding hulk of a man standing tall at 6’4, has clearly had some bad experiences with women. His truck proclaims, “Take poison but not believe on girl”. He tells me that he usually doesn’t let Gujjars travel with them since they stink, but that he relented when he found that Javed had already made a commitment. Javed, a lanky man with a shapely beard and a ready smile, is charging ₹5,000 from the Gujjars for transportation, not an entirely insignificant amount. They soon get down to prepare food on a gas stove, a simple meal of dal-chawal. All Kashmiri truck drivers carry food supplies with them on their journeys. Dhabas in Kashmir are a few and far in between. Also, massive unpredictable traffic snarls that snake through the mountains are common because of the narrow rundown roads. In the winters, when the highway gets snowed over, it can take up to 10 days for truckers to cover 300 kms from Jammu to Srinagar. In such circumstances, lack of food supplies can very well mean starvation. After dinner, we drive for a while and stop some distance before Udhampur. The truckers decide that it’s time for a nap. The plan is to join the convoy that’ll be flagged off from Udhampur around midnight. It’s getting a little chilly and everybody lies down on blankets by the side of the highway, waiting for the signoff. Arub tells me he’s studied till Class 8 and requests me to find some job for him. But when I ask him what kind of job he’s looking for, it turns out that he’s not really open to working outside J&K. “I know all the secret mountain trails, I can take you to places where you won’t even find a mobile signal. I can be a good guide here. I know all about the medicinal herbs, how to find food, and how to keep wild animals away. If you know any tourists or foreigners who are coming to Kashmir, I can help them,” he appeals. He even confides in me and tells me of an herb that grows in isolated areas — places where the sound of dogs, donkeys and girls can’t be heard -— the possession of which makes women desire the owner. His sustained enthusiastic pitch makes me feel quite useless at this point, I tell him I will try my best, and note down his phone number. It is then I realise that modernity is taking a terrible toll on the traditional pastoral lifestyle of Gujjars and Bakarwals. Dr Tufil also notes, “We found that their major chunk of income comes from livestock earlier, but now it is shifted towards other categories such as land resources, labour works, tourism, business and government jobs.” Arub’s younger brother himself is studying in an engineering college in Jammu. After some hours, Liaqat gets a call from a cousin who’s at the Udhampur naka informing them that the convoy has started moving. We get going and in the reshuffle, I find myself in Javed’s truck along with Arub, the Gujjar couple and their child. At dawn, we stop so the truckers can bathe underneath a waterfall and I find myself surrounded by sparkling streams, sheer cliffs and distant snow-capped peaks: a throwback to the Kashmir depicted in old Hindi movies, except that the gorgeous scenery is interrupted by the presence of men in olive green uniforms with guns pointed nowhere. The roads are narrower with patchy stretches in between that have either been washed away in the floods of September 2014, or have always been like this. One can never be sure since the roads are consistently bad after Udhampur; loose rocks line the edges of the highway overlooking ravines, making it quite a nail-biting experience to travel. We pause for a while after we find out that one of the trucks in our retinue is positioned precariously at the edge of a cliff after the driver dozed off at the wheel. Javed shouts at the driver to get his act together and carries on. Recently, the J&K state government has taken note of the dismal condition of roads and has earmarked ₹4,000 crore for the ‘state-wide road upgradation programme in the state for the current fiscal’. The Baramulla-Benihal railway line is a lifeline for commuters and has eased passenger traffic on NH44, but for truckers, things have only gone from bad to worse, especially after the floods. The J&K policemen dressed in light blue uniforms, frequently try to stop us, but Javed is steadfast in evading them. He maintains a scornful attitude towards the police, thinking of them not as upholders of law and order, but as extortionists in uniform earning haraam ki kamaai. Policemen try to stop our truck four times during the journey and Javed is successful in dodging them every time, turning his steering wheel abruptly to make stoppage impossible. Once, a policeman runs along beside our truck on a slight incline, waving a lathi at Javed. He sarcastically tells the police to take his money tomorrow, upon which the policeman moves to strike him with the lathi, which Javed deftly dodges. But it’s not as if the truckers with me are the epitome of law-abiding citizens. Upon crossing Ramban, a small town by the Chenab river, we make a stop at a dhaba after Liaqat gets a call from a friend in the know; the deputy superintendent of police is lying in wait ahead, a man known to charge up to ₹2,000 from overloaded truckers. All the trucks in our retinue happen to be overloaded. Their bosses do hand over a modest amount for such exigencies. But being street smart and avoiding such ‘unnecessary’ overheads is a big way how most truckers supplement their measly salary of ₹5,000-8,000 per month. Clearly, lawlessness is embedded in the way our country functions. As usual, nobody is to blame; it’s the ‘system’. Towards evening, we near the Jawahar tunnel, a 3 km long, single-lane tunnel after which “Asli Kashmir shuru hota hai,” in the words of Javed. “We have to drive at the same speed inside the tunnel. We can’t accelerate,” Javed tells me. Once we cross the tunnel, I see ‘STOP FOR CHECKING’ barricades every few metres ahead. Barbed wire makes a distinct appearance, often fencing tourist stop points idyllically named ‘Titanic View Point’. After an hour, we stop at the Jammu-Kashmir tax collection naka. All our trucks are overloaded, which typically entails a hefty fine, a variable amount depending on how overloaded the truck is, but Liaqat says that a bribe of ₹900-1,000 to the clerk is sufficient to avoid any penalty, irrespective of the quantum of overloading. Clearly, the state is losing out on a lot of revenue. The only person Liaqat seems to be wary of is the vigilance officer. He tells me of a time when he was about to hand over his usual bribe to the clerk and the clerk refused to take it. Bewildered, he turned around, only to find the officer standing right behind him! 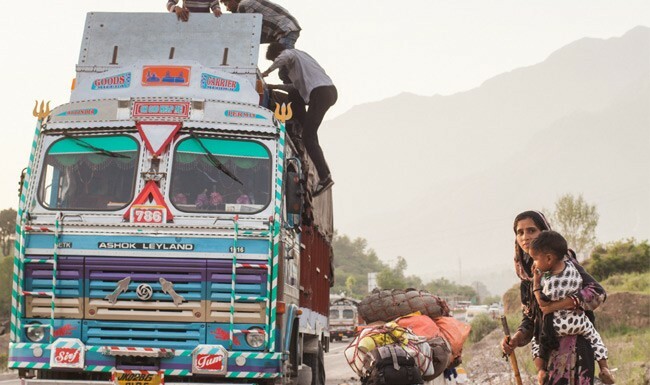 The Gujjars typically hitch with truckers only until after the Jawahar tunnel, at which point they disperse along mountain trails towards known pastures. Around 20 km after we cross the tunnel, Arub says that his point of departure is imminent and promises to ring me up. He takes his feet up on the seat, puts his arm around me affectionately and I notice that he’s not taken his shoes off. When I ask him the reason, he says, “So that my stinky socks don’t bother you people.” I laugh and promise to call him too. They disembark in a hurry and make their way on a dirt path leading off the highway, shadowy figures in the twilight. We soon settle down for a sumptuous dinner of rajma-chawal. I have stopped caring how far Srinagar is anymore, stopped trying to catch a glimpse of milestones, most of which are terribly mutilated anyway. Liaqat tells me we’ll rest for the night and reach Srinagar the next afternoon. I was thinking we’d reach earlier, but I’m not disappointed. Instead, I submit myself to the moment; truck journeys are inexplicably improvisational in nature and I find myself giving in to the uncertainty. As I’m about to settle down for a good night’s sleep, I notice on the truck a self-contradictory statement that perfectly captures the spirit in which most of India’s hardy souls lead their lives: ‘Work like a coolie, live like a prince’. That’s not a bad way to live, I think to myself, and drift off to sleep, dreaming of Srinagar and asli Kashmir. This is the second of a six-part series on the highway economy. Wonderful descriptive post looking forward on reading more!